Media pay lots of attention now to food additives and unnecessary or potentially harmful fillers in food… for humans. What about our beloved pets? Television and magazine ads make dog and cat food sound as though it is designed and produced with great care and attention to each species specific nutritional needs. Can we be sure? Frequently, we hear of people taking the extra step to prepare cat food and dog food at home. Some folks select all organic meats and vegetables. Others simply prepare their pets’ food because they like truly knowing there are no fillers or potential dietary risks. For many of us, we might start out making treats for our pets. Then we may sometimes make “entrees” for our dogs and cats. Miles, our favorite Newfoundland, let us know about his favorite goodies. He even gave us permission to share a couple of his recipes with you here. Because it’s summer here, he chose a couple of his favorite icy cool treats. I’ve told you how I love what we call “Cheap Cookies.” Okay, they’re called “ice cubes” in human lingo. They are GREAT in the summer, especially. However, for variety, try this upgrade. Place a bit of chicken or beef in each ice cube tray. Pour broth over and freeze. AWESOME! Except for really large dogs, only fill each ice cube tray ¼ to ½ full. Cut up the fruits and veggies in small pieces and put in ice cube trays. Pour water over the fruits and veggies. (Only fill to ¼ or ½ full if your doggie is small.) Once frozen, store in closed plastic bags in the freezer. Along with all of Miles’ favorite recipes, you will find his favorite pet jokes and quotes, details on dog heroes, and even Presidential pet lists in the FREE bonuses he includes with the purchase of his book, “Dog Days in the Life of the Miles-Mannered Man.” Both the eBook and paperback formats are filled with his stories, adventures and misadventures, and life philosophies for good living… along with lots of great laughs. Check out this title and more from Quiet Thunder Publishing, widely available on sites like Amazon.com… with love and laughter. 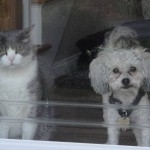 This entry was posted in Must Love Dogs (& Other Wonderful Pets). Bookmark the permalink.